Step 1 In a small, heavy-bottomed saucepan, gently heat one-half cup water, the butter and the salt over medium-low heat until the butter is melted. Step 2 Bring the butter mixture just to a boil (prolonged boiling evaporates the water and changes the proportions of the dough). Remove the saucepan from the heat and immediately add all the flour. Beat vigorously with a wooden spoon for a few moments until the mixture pulls away from the sides of the pan to form a ball. Beat for about 3 minutes more over low heat to dry the dough. Take the pan off the heat. Step 3In a small bowl, beat one egg until mixed; set it aside. In a separate small bowl, beat the second egg; mix it directly into the dough. Then beat in enough of the reserved egg (about 1 tablespoon) so the dough is shiny and just falls from the spoon. Beat the egg quickly into the dough -- it needs to incorporate into the heated dough so it does not scramble. Cover the dough in the pan lightly with plastic wrap to prevent a skin forming, and set it aside until cool. In Recipes-list.com we have selected the most viewed recipes from category - Appetizers Fish and shellfish . Enjoy the best recipes specially selected for you! 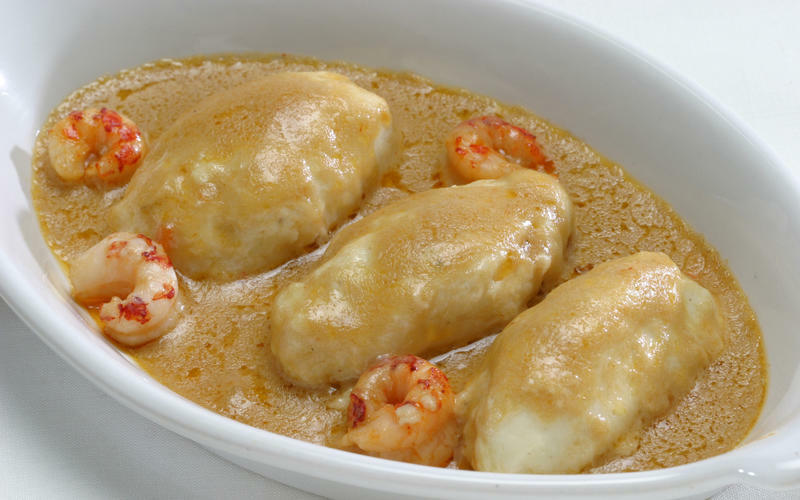 Quenelles Nantua is the right choice that will satisfy all your claims.